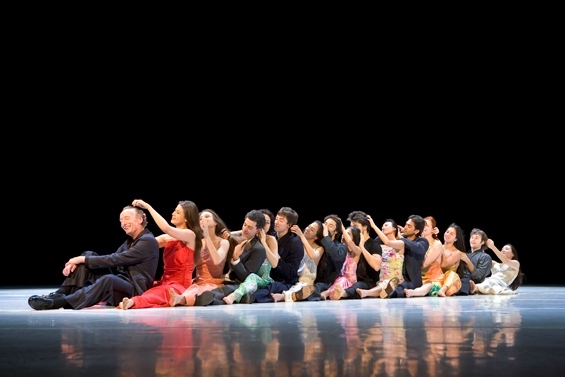 There’s no mistaking the signature style of Pina Bausch in her final work, Como el Musguito…, developed in Chile as part of her World Cities series and premiered a fortnight before her death in 2009. The women wear sumptuous gowns, the men are in monochrome suits, and the piece unfolds as a collage of cameos circling themes of folly, absurdity, desire and disparate sexual dynamics. Yet if the look is familiar, the feel is strange, most noticeably in the relations between men and women. Out with mutual incomprehension and competitive powerplay, in with – it’s hard to believe – gallantry. Typical is a scene where Fernando Suels Mendoza offers effusive compliments to each passing woman, which the women simply accept – not because they believe him, but because if compliments are to be had, they might as well enjoy them. Elsewhere, gentlemanly Damiano Ottavio Bigi vacates his chair for a gracious lady, and Anna Wehsarg playfully tosses her hand in the air, delighted that Mendoza catches it each time, covering it with courteous kisses. Couples walk arm in arm, and a woman dancing a rumba explains that she is living for the moment. It’s remarkably convivial. But not superficial. There’s a mood, an attitude to the work – to the women in particular – that suggests an appreciation of beauty and an acceptance of simple pleasures: the feel of a frock, the flow of one’s hair. In many solos, the women seem to dance for no one but themselves, luxuriating in their own limbs. When the performers form human chains, they’re not the arbitrary, ship-of-fools clusters of earlier Bausch but little plaits of togetherness. The music – easy on the ear folk melodies, popular songs and loungy jazz – is mostly gentle, often tinged with melancholy. Such lack of conflict makes the material sometimes feel underpowered, but also sensitises us to more elusive dramas: men fleeing like fugitives; a sudden onrush of windblown figures; whistles and claps echoing like unanswered cries. Above all, the cracks in the floor that almost imperceptibly widen and close again, unstable tectonics supporting the human life above.